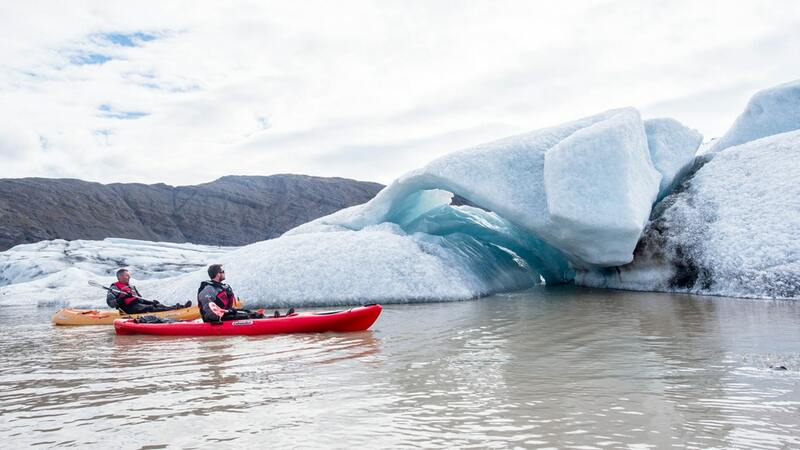 If you are looking for a unique way to experience the icebergs of the east, then the Glacier Kayak Adventure tour is the perfect choice for you! 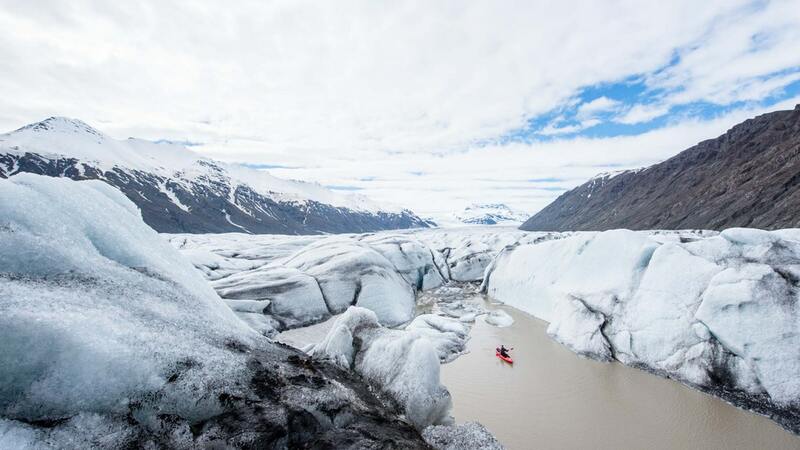 Go on a true adventure and explore the wonders of the Heinabergslón glacier lagoon with expert guides. This tour is the perfect addition to any day spent exploring the beautiful glacier lagoons of South East Iceland. 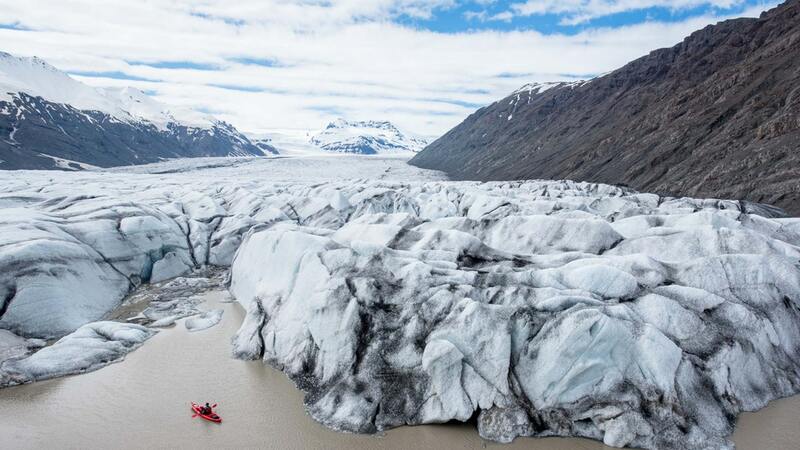 After meeting up with your guide and group, you’ll drive a short journey to the stunning Heinabergslón glacier lagoon. Located off the beaten path, this lagoon offers a peaceful experience with nature. After a safety briefing, you’ll kayak out on the lagoon. Here you will get up close and personal with the glaciers that float on the lagoon. 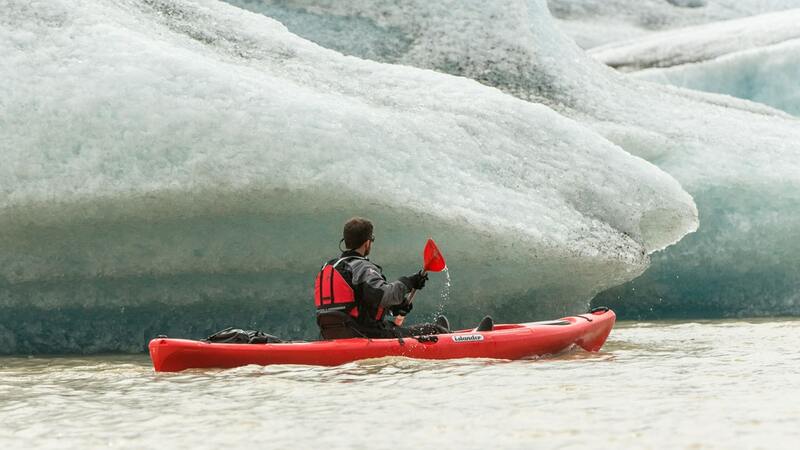 As the glacier lagoon is ever-changing, your guide will take you on the best possible route each day. This means that no two tours are alike, and you never know what adventures lie ahead! 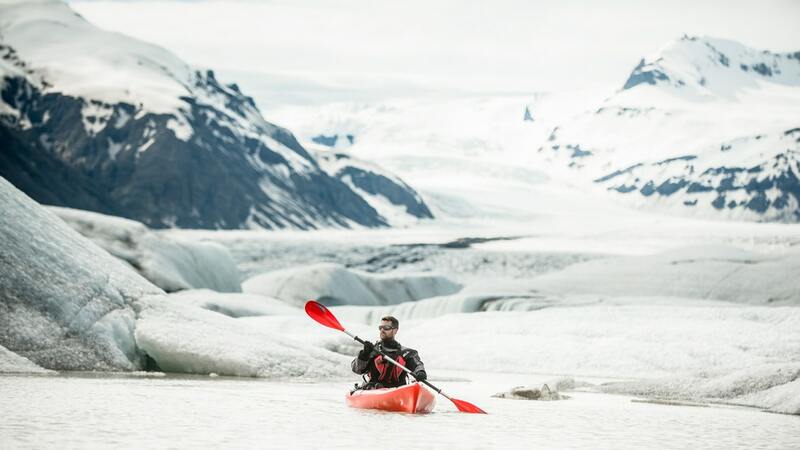 You’ll spend about 2 hours out on the lagoon during the glacier kayak tour, enjoying the stunning nature that surrounds you. This tour is a great option for all types of adventurous travelers who are looking for special experienced in Iceland. How do I book this tour for an odd number of guests (3, 5, etc.)? Book single kayaks for all guests. Note that the single kayak price is higher than when two persons share a kayak. Please also note that children 14 – 16 years old must ride in a double kayak with an adult. Make two bookings, you can use the shopping cart so you only have to check out once. Create a booking for the number of guests who will be sharing a kayak and add it to your shopping cart. Return to the tour and make a booking for the guest/guests that will be in a single kayak and add it to your shopping cart. You can then check out a complete order for all guests. If you have any problems with booking the tour or have questions about the booking process, please email us at info@iat.is. The meeting point for this tour is at the Flatey Farm, not to be confused with Flatey island! Flatey farm is located about 30 mins. drive west from Höfn, and about 35 minutes east of Jökulsárlón glacier lagoon. Guests must be at the meeting point at least 15 minutes before the start of their tour. Please click the “How To Get There” button above to see a map of the area. Can I add transportation to and from Reykjavík to this tour? No, this is a meet-on-location tour only. You should wear warm outdoor clothing like regular hiking pants and a fleece sweater. Also, bring a warm cap and socks (synthetic or wool). We also recommend sunglasses and light gloves. Good hiking boots are essential. The boots should be high enough to provide good ankle support. The boots should be water resistant and meant for hiking and outdoor activities. How fit do I need to be to participate in this tour? Although the kayaking is at an easy pace, you need to be in reasonably good physical condition. For example, you need to be able to walk at least 2 km with short breaks at a pace of about at a low pace of 2-3km/hr (1.2-1.8mi/hr). No, the age limit for this tour is not flexible. No, meals are not included in this tour. You can buy refreshments at the meeting point at Flatey farm. Please be at the meeting point no later than 15 minutes before the start of your tour.